As mentioned in the first post on Depth of Field, there are some shortcomings to creating a DOF effect in a rendering entirely as a post-processing operation. The biggest shortcoming is that any distant reflections showing up in reflective materials in the rendering will be uneffected by the zdepth layer that the software generates. 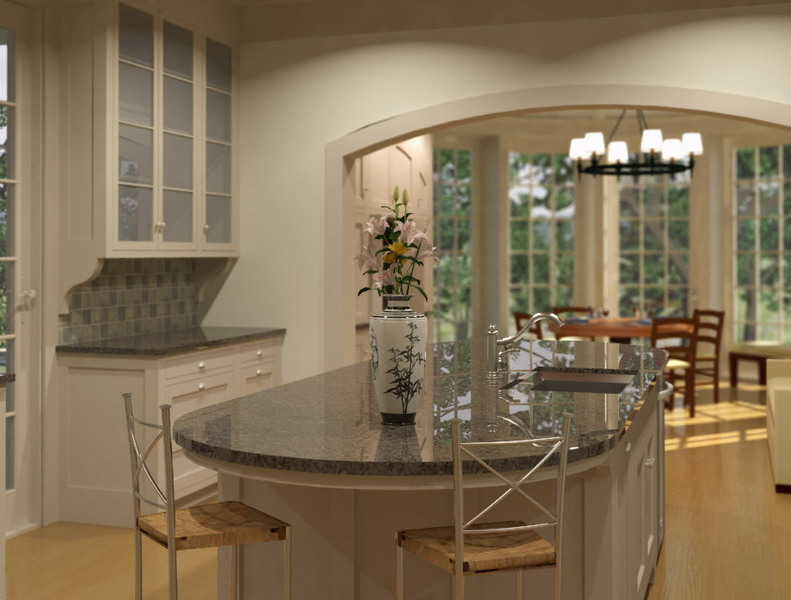 Here is an example of an interior rendering with a reflective granite countertop. As you can see, Zdepth takes care of blurring the distant subjects in this view – the dining room and the trees outside. However, the reflection of the trees in the counter is not affected at all! Good: depth of field effect is realistic – based on phsyical properties of the camera, and consistently affects all aspects of the image including reflections and refractions. Added difficulty: takes an understanding of camera values such as aperature and focal length to successfully tweak the amount of blur. Bad: no quick way to adjust settings on the fly – need to recalculate a new rendering for each adjustment. Bad: not as smooth as photoshop blur. What I end up doing in my renders is to use the best of both options. Where there are reflections, I will run a rendering with DOF turned on, and at the same time generate a zdepth layer that I can use post-process to give the blur a nicer appearance. Here is the final result using a combination of both rendering engine DOF as well as post-processed DOF blur.